A member of the Institute of Cost Accountants of India, Shri Manoj Mishra has professional experience of more than 30 years in various Public Sector Undertakings and Co-operative sector. Prior to his appointment as C&MD, NFL in June 2015, Shri Mishra held the position of Director (Finance) in State Trading Corporation (STC). Before joining STC in 2010, Shri Mishra held various positions in Krishak Bharati Co-operative Limited (KRIBHCO) for 23 years. Shri Mishra also remained Chairman of Ramagundam Fertilizers & Chemicals Ltd. (RFCL), from June 2015 to Feb. 2017. RFCL is a joint venture of National Fertilizers Limited with Engineers India Limited (EIL) and Fertilizer Corporation of India (FCIL) for revival of closed urea plant at Ramagundum in Telangana with a new urea plant of 1.27 million Tonnes per annum capacity. 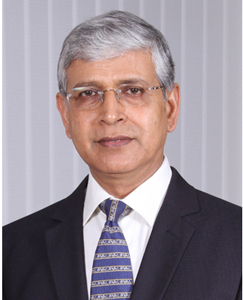 Shri Mishra held additional charge of Chairman & Managing Director of Rashtriya Chemicals & Fertilizers Limited (RCF), from June 2016 to March 2017. He was the ex-officio Chairman of Talchar Fertilizers Limited (TFL), a joint venture of RCF, GAIL, Coal India Limited and Fertilizer Corporation of India (FCIL) for setting up a coal based fertilizer plant at Talchar in Odisha. He was instrumental in providing pace to the project by achieving various milestones including finalization of technology for coal gasification process. With an extensive professional experience in fertilizer industry, Shri Mishra is well conversant with various issues related to the industry. He has been credited with creating new identity of NFL with extended product line and new ventures. 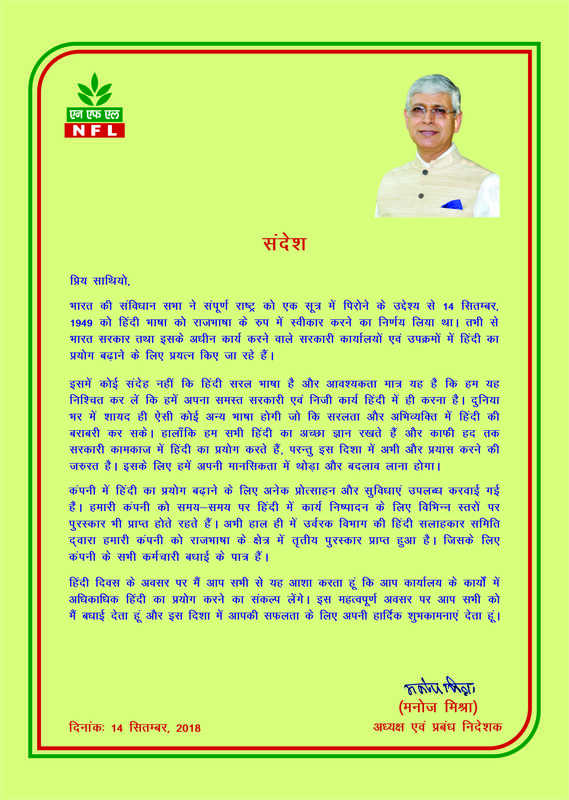 He successfully transformed NFL from a single product company to an organization with stakes in various types of fertilizers, seeds, agro-chemicals and Industrial products. As a team leader, Shri Mishra encourages interaction among team members for better exchange of ideas, which results in higher productivity in the organization. Under his leadership, NFL has recorded its best ever performance in 2016-17. Shri Mishra has visited abroad on a number of key assignments related to fertilizer sector as well as for exploring trade opportunities. He had been to Australia, Singapore, Hong Kong, Taipei, Algeria, Morocco, Russia and other African countries in connection with exploring business opportunities in fertilizer sector. Shri Manoj Mishra is Co-Chairman of Fertiliser Association of India (FAI), a body which represents fertiliser industry in India. He is also a Director on the Board of International Fertilizer Association (IFA), a Paris based organization that represents the Global Fertilizer Industry. He is the first ever executive from Indian Fertilizer Public Sector Undertakings to hold this prestigious position in IFA. The hallmark of Sh. Mishra’s success is his sustained discipline, hard work and commitment to the profession and company as a whole.